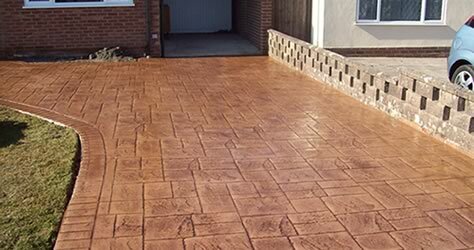 Paving and driveway specialists BOMANITE offer the art of creative paving. Our decorative concrete is an innovative imprinted concrete paving which gives long lasting colour, pattern and texture with the added benefit of durability and a virtually maintenance free finish.EVEN if you have never heard of Bomanite before you have probably admired and walked on our paving. It's a crafted product that's used in 70 countries worldwide and backed by over sixty years experience since its inception in the USA. Bomanite is the inventor of pattern imprinted concrete paving and in a matter of days can turn a dull surface into a decorative and stylish one using designs which give the look and feel of traditional natural materials such as cobbles, tile, stone or slate but at a realistic and affordable price. EVEN if you have never heard of Bomanite before you have probably admired and walked on our paving. It's a crafted product that's used in 70 countries worldwide and backed by over sixty years experience since its inception in the USA. Bomanite is the inventor of pattern imprinted concrete paving and in a matter of days can turn a dull surface into a decorative and stylish one using designs which give the look and feel of traditional natural materials such as cobbles, tile, stone or slate but at a realistic and affordable price. 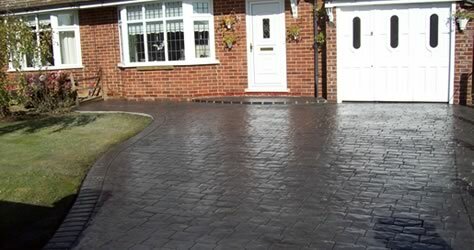 In just a few days you could be enjoying a beautiful new driveway or patio creating a stunning first impression and adding value and prestige to your home. Innovative systems in the hands of highly creative, skilled craftsmen translate to extraordinary architectural concrete paving and flooring solutions.Bomanite paving partners exclusively with a worldwide network of experienced and specially trained concrete professionals dedicated to the highest standards of quality and service. Bomanite paving have over 25 years of experience of paving in the UK. If you imagine a driveway is just a driveway, our website will open your eyes and stretch your imagination. You are about to discover the wonders that can now be achieved with the minimum of fuss, disruption or delay. In just a few days we can create the ultimate first impression. A driveway so carefully conceived and individually designed that it flatters and transforms your home. And is virtually maintenance free and so well constructed it will look beautiful for many years to come. Bomanite – the company that invented the imprinted concrete process more than a half-century ago – form an unbeatable, unique team. Even the most carefully block-paved, gravelled or tarmacadamed driveways are vulnerable to tenacious weeds, moss and mould growth. With our paving yoiu can say goodbye to the most exasperating job on the gardening calendar, because our driveways are specially constructed to remian virtually weed and maintenance free for life. All our driveways, patios, steps, swimming pool surrounds and decorative concrete works are in the hands of highly creative, skilled craftsmen who have been specially trained to the highest standards of quality and service. This exclusive network of specially trained, highly skilled licensed Bomanite craftsmen offer something that your local installer can not match.